FILE - Rohingya people who fled from their towns after violence in the state of Rakhine are seen behind a fence on the border line outside Maungdaw, Myanmar, March 31, 2018. The government of Aung San Suu Kyi is opening the economy and growth is rebounding in Myanmar, though the possibility of broader Western sanctions over the Rohingya refugee crisis is nevertheless giving some foreign investors pause, according to a senior IMF official. Shanaka Jay Peiris, the International Monetary Fund's (IMF) mission chief to Myanmar, said in a recent interview that initial data reviewed by the IMF indicated that some foreign investors were delaying final approval of projects until there was clarity about how the situation may unfold. "The numbers we have for FDI [foreign direct investment] aren't showing it yet ... but foreign investment approvals are slowing down, so there is some indicator that going forward FDI may be weaker," Peiris told Reuters following the publication last week of the IMF's latest review of Myanmar's economy. 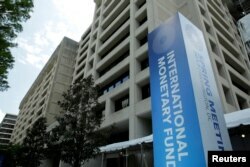 FILE - The International Monetary Fund headquarters building is seen in Washington. "Since August, investors are taking a pause. It isn't a surprise," he said. He said it was unclear which projects were being delayed and added that more data was necessary to better understand whether the "pause" was temporary or not. However, leading indicators such as FDI project amounts approved by Myanmar's government for the first 10 months of fiscal 2017/18 from April show "a marked slowdown" since September 2017, according to the IMF. For now, FDI inflows for 2017/18 still look to be a "solid number," Peiris added. While it is too soon to know what it could mean for the overall economy, Peiris said: "We have to see whether project approvals were temporarily lower or will be a trend, as well as whether actual FDI inflows will fall by much. The magnitude would also matter." "We are not operating under the assumption that there are going to be broad economic sanctions," he added, downplaying the risk of a decline. Myanmar government spokesman Zaw Htay said that, "Especially in Myanmar, because of the Rakhine issue, tourism has come down, investments and FDI have come down too," adding that the authorities were working hard to ensure macroeconomic stability. The report by the IMF, which follows annual consultations with the government, followed a November visit to Myanmar, the first since nearly 700,000 Rohingya fled to Bangladesh after a military crackdown condemned by the international community. 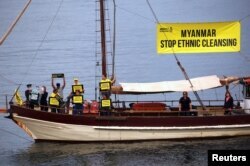 FILE - Protesters from Amnesty International display banners regarding the the Rohingya crisis in Myanmar as they sail near the venue for the one-off summit of 10-member Association of Southeast Asian Nations (ASEAN) being held in Sydney, Australia, March 16, 2018. The World Bank announced on Oct. 13 it was delaying the release of $200 million in budget support for Myanmar in response to the "forced displacement of the Rohingya." Both the United States and Canada imposed sanctions against a general in Myanmar's military for his role in the crackdown against the Muslim Rohingya. The European Union said in February it was preparing sanctions against military leaders to hold them accountable for their role in the crisis. The Trump administration's aid chief, Mark Green, said last month he will visit Myanmar soon for talks with the government and to see for himself conditions of the Rohingya refugees. "If the sanctions are limited to the military personnel, which has been the case to now, we believe it will be less of an impact" on the economy, Peiris said. "If it is broader, it would be more worrying." Overall, the IMF sees economic growth picking up toward an estimated potential rate of about 7 to 7.5 percent after lower-than-expected growth of 5.9 percent in 2016/17. The United States remains concerned about the plight of the Rohingya, a Treasury official told Reuters, declining to comment on the status of sanctions investigations. Another U.S. official said the Trump administration was reviewing all options on Myanmar. When asked by Reuters how concerned the government was about more sanctions, the Myanmar spokesman said such actions would affect "the whole country" because Myanmar was no longer a military dictatorship but instead run by "a democratic government elected by the people." "They shouldn't do the economic sanctions," the government spokesman said. "If the investments are affected, then it affects the people." The IMF visit came shortly before Myanmar introduced regulations to bring the country's banks closer to international standards and force them to recover mostly open-ended "overdraft loans" that make up the bulk of their lending. FILE - An employee counts Myanmar kyat banknotes in a bank in Yangon, April 5, 2012. Myanmar's central bank deputy governor, Soe Thein, told Reuters in November that private banks had been given more time to clear most of their loan books. "It is more fragile than what has been published, so banks will have to raise capital and recognize losses," he said. "The question is whether owners are willing to put up the money, and if they can't, will they try to find partners? How that will evolve is hard to tell but they will need more capital," he said. The Fund would have a better perspective of the situation during its next visit later this year, he said. "We and the central bank do have a sense that it is a significant issue," he added. Asked whether the government agreed with the IMF assessment on the banks, the Myanmar government spokesman said reforms were important to build economic stability. "It is necessary to be careful," he said, "We cannot afford to make any mistakes."